THE PAST AND PULP COLLIDE IN PRO SE PRODUCTIONS' "HIGH ADVENTURE HISTORY!" Pulp Happens…Throughout History! 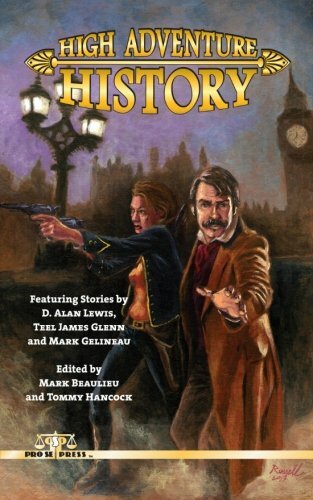 Pro Se Productions, a publisher of Genre Fiction, proudly presents HIGH ADVENTURE HISTORY, an anthology that puts the fast pacing and over the top action of Pulp Fiction in the History books! Setting tales in the past and telling them with a predominantly Pulp flavor, these stories find action and adventure in the annals of yesterday for readers today! Take a trip to the past with authors D. Alan Lewis, Teel James Glenn, and Mark Gelineau as they redefine High Adventure and History! Action, Adventure, Espionage, Mystery, and Horror abound in tales of days gone by in this thrilling collection. With a stunning cover by David L. Russell, design and formatting by Jeff Hayes, David Foster, and Russ Anderson, this volume will definitely prove to be historic. Relive the Past with Extra Pulp in Pro Se Production’s HIGH ADVENTURE HISTORY. HIGH ADVENTURE HISTORY is available on Amazon and in Pro Se’s own online store in print and coming soon to physical and online outlets as well for $9.00. The anthology is also available as an eBook on Amazon, Barnes and Noble, and Smashwords for only $2.99. Take a Step in the Past for three of the best stories written today! HIGH ADVENTURE HISTORY from Pro Se Productions. If you’re a reviewer and interested in a digital review copy or if you wish to interview the authors or want more information on this title, contact Pro Se’s Director of Corporate Operations, Morgan Minor at MorganMinorProSe@yahoo.com. PRO SE PRODUCTIONS DEBUTS NEW YOUNGPULP TITLE- THE SISTERS ARCANA!